With the Linear Bushing nut having the most accurate cylindrical shape, this type is widely used. Containing two units of the standard retainer plate, this type is optimal for locations where a moment load is present and reduces man-hours in installation. The nut of the standard type Linear Bushing is integrated with a flange. 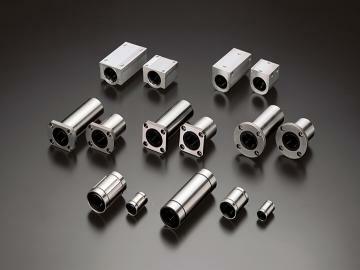 This enables the Linear Bushing to be directly mounted onto the housing with bolts, thus achieving easy installation. Like model LMF, this type also has a flange, but the flange is cut to a square shape. Since the height is lower than the circular flange type, compact design is allowed. The nut is integrated with a cut flange. Since the height is lower than model LMK, compact design is allowed. Since the rows of balls in the Linear Bushing are arranged so that two rows receive the load from the flat side, a long service life can be achieved. Weight reduction of the housing is achieved by adopting a high-strength plastic instead of the conventional metal for the flange. Best utilized in a moving portion of an application. It is a case unit where the standard type of Linear Bushing is incorporated into a small, lightweight aluminum casing. This model can easily be mounted simply by securing it to the table with bolts. This type has the same dimensions as the standard type, but the nut has a slit in the direction of the LM shaft. This allows the linear bushing to be installed in a housing whose inner diameter is adjustable, and enables the clearance between the LM shaft and the housing to easily be adjusted. The nut is partially cut open by one row of balls (50 to 80 degree). This enables the Linear Bushing to be used even in locations where the LM shaft is supported by a column or fulcrum. In addition, a clearance can easily be adjusted.